Since its launch in May last year, President Moon Jae-in’s administration has refrained from following in the footsteps of previous administrations, which sought to bolster the economy by undertaking massive infrastructure projects. It has been particularly critical of the attempt by former President Lee Myung-bak’s government to restore the country’s four major rivers, arguing that the costly project did little to increase employment and caused severe environmental damage. The Moon administration is reducing spending on building and refurbishing social overhead capital, while expanding expenditures on welfare, employment and education programs. Government spending on infrastructure was cut from 23.7 trillion won ($21.1 billion) in 2016 to 19 trillion won this year. Further cuts planned for next year would push that figure down to 18.5 trillion won, according to the Ministry of Economy and Finance. Infrastructure outlay is set to shrink to 3.9 percent of the national budget in 2019, as compared with 6.1 percent in 2016. The fall in infrastructure spending, coupled with the government’s measures to curb soaring housing prices, has dampened construction investment. Construction investment decreased 6.4 percent on-quarter in the July-September period, following a 2.1 percent contraction in the previous three months, according to Statistics Korea. The figure for the third quarter marked the steepest decline in more than two decades. Reduced construction investment depressed the country’s on-quarter economic growth for the July-September period by 0.3 percentage point. The third-quarter growth rate stood at 0.6 percent, bolstered mainly by a rise in exports. According to the Construction and Economy Research Institute of Korea, construction investment is likely to decrease 1.3 percent from a year earlier in the second half of this year, reducing the growth rate for the cited period by 0.22 percentage point. 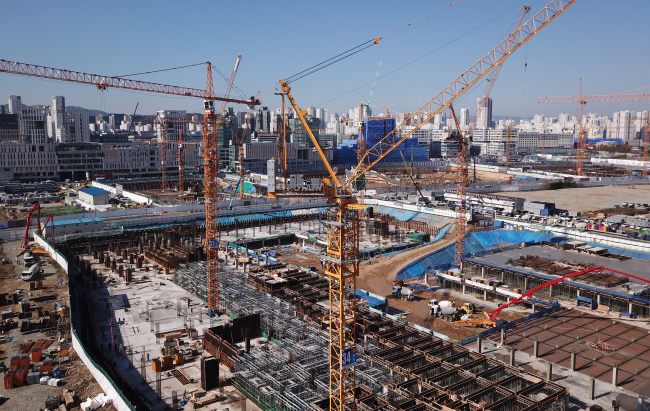 The construction industry accounted for 4.23 percent of Korea’s gross domestic product in the third quarter, down from 4.5 percent a year earlier. The institute expects this year’s decrease in construction orders to drive more than 320,000 workers out of their jobs in the coming years. In a debate last month, Na Kyung-yeon, a CERIK researcher, said infrastructure spending needed to be expanded by an annual average of 12.6 trillion won in the coming years to ensure that the country’s economy continues to grow between 2.5 percent and 3 percent annually. In the final year of Moon’s five-year term, Na said, infrastructure spending will be less than one-tenth of fiscal expenditures on social welfare programs if the government goes ahead with its current plans. An earlier study by the institute estimated that spending an additional 442 trillion won on 1,244 key infrastructure projects over the next eight years in areas outside Seoul would create 197,400 jobs annually. Household income and private consumption would then rise by 6.96 trillion won and 4.97 trillion won, respectively, each year over the cited period, with the economy growing by an additional 0.85 percentage point annually. “Infrastructure investment is a more effective tool for boosting the economy than the government’s measures designed to create mostly temporary jobs,” said Kim Tae-gi, an economics professor at Dankook University. Some ruling party lawmakers agree on the need to expand infrastructure spending to bolster the sluggish economy and turn the troubled employment market around. Rep. Chung Sung-ho of the Democratic Party of Korea, who sits on a parliamentary committee that deals with finance and the economy, said the Moon administration needed to be more flexible on infrastructure spending. He said the expansion of social overhead capital would be required to ensure the success of its other policies. But other ruling party members, along with aides to Moon and progressive civic groups, have opposed the expansion of infrastructure projects, saying such a move would only benefit large construction companies. The government recently announced plans to build what it has described as forms of social overhead capital with greater relevance to community life. But critics say such projects are unlikely to bring about substantial effects. They say the government’s efforts to promote privately funded infrastructure projects cannot succeed without a significant increase in public infrastructure spending to match the private capital. Questions have also been raised about budget planners’ assertion that Korea has sufficient SOC stock, or infrastructure. “Given population density and income levels, Korea lags far behind other advanced nations (in infrastructure),” said Park Tong-kyu, a professor of finance at Hanyang University. The planned cuts in infrastructure investment also can be seen as turning a blind eye to the need to refurbish aging facilities around the country. Experts say demand for SOC improvements will increase sharply in the coming years as the life cycle of the country’s decades-old infrastructure facilities comes to an end. They contrast the Moon administration’s push to cut budgets needed to build and refurbish roads, railways and bridges here with its eagerness to participate in North Korean infrastructure construction projects.